Wondering about Pinterest Group Boards? Should you leave underperforming boards? Once you’ve found a good one, how can you get added? Should you host your own group board? I’ve been asking these questions for months – and not getting any definitive answers. But I’ve also been looking hard at my Pinterest stats. Pinterest Group Boards are hurting my Pinterest account. Most of them, anyway. But this may be different for you. If you’ve read any of my blog posts on Pinterest before, you’ve heard me crow about how Tailwind helps me gain followers and traffic. I’m currently at 20K followers, and 50K–100K website visits monthly from Pinterest. You might not be in this same (fortunate) position. If you’re new to Pinterest and have just a handful of followers, you may find group boards helpful. I suggest you read my cautions before spending a lot of time and effort on them, though. Pinterest allows its users to organize images and videos into personal collections known as boards. A group board is just like a regular board, except that the owner can invite collaborators to pin on their board. Group boards were once an amazing way to increase your reach on Pinterest. That’s because your pins can be seen by a whole new audience: the board owner’s followers and collaborators. Then Pinterest Smart Feed happened. Some people think group boards are being penalized, because they’re no longer seeing the reach, repins, and clicks they got a year or more ago. But it’s really due to the Smart Feed. Pinterest now prioritizes content based on engagement (and more). 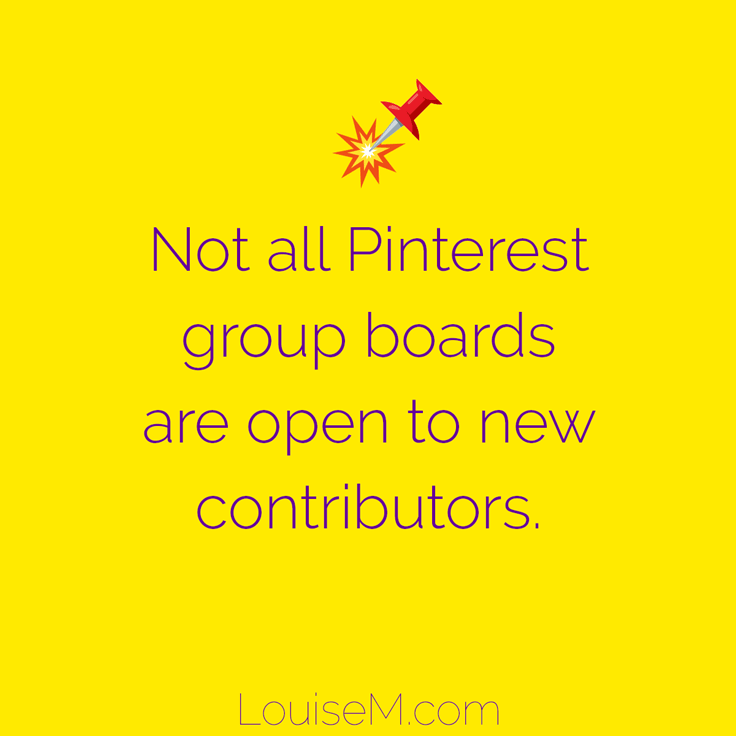 Group boards are often a “dumping ground” for pins, and the collaborators rarely (if ever) look at the board and repin other members’ content. Now Pinterest assumes the pins are crummy, because no one’s interacting with them… so it doesn’t show them in the Smart Feed. Most articles I’ve read about group boards seem to advocate a “join as many as you can and post as much as you can” philosophy. I believe this is unhelpful. It seems some pinners see pinning 100 times a day as the holy grail. Wrong! I’ve read on several different blogs that pinning over 50 times a day actually reduces your results. Pinners going above 50 Pins a day see a large drop off of Repins. And did you know there’s a limit on how many pins you can ever add to Pinterest? It’s 200,000 source. If you pin 100 times a day, you’ll reach that in less than 5 1/2 years. Not much of a long-term strategy! 30 pins a day is optimal. No, you won’t start there, but your goal shouldn’t be to crank out as many pins as you can – it should be to pin quality content to quality boards. “Spray and pray” doesn’t work. Join less boards, of better quality, and actively engage on them. It fits your niche: My stats show that group boards which allow any kind of pins perform poorly, with less than 1 repin per pin on the board. For comparison, my top (non-group) boards average 37, 43, 58, and 114 repins per pin. A board that is netting me a low number of repins is reducing my status in Pinterest’s eyes (and the SmartFeed). Bonus points if the group board has a keyword-optimized title and board description. Also check to see the pins are on-topic. I can’t over-emphasize how important sticking to ONE topic is for the board’s success. Just ignore group boards that don’t fit your niche. It doesn’t have too many contributors: Boards with 100+ contributors are hard to moderate, and more likely to be of low quality. It’s active: I’ve joined some group boards where I seem to be the only one pinning. This is pointless. It’s not crazy active: The stream moves way too fast for members to see and repin your content. I don’t know how to determine this, but a high number of contributors is a clue. Reciprocal pinning is encouraged: While I don’t think it’s possible to enforce this, the group rules should tell you to share others’ content. And, you should! It not only helps your board mates, it helps you too. 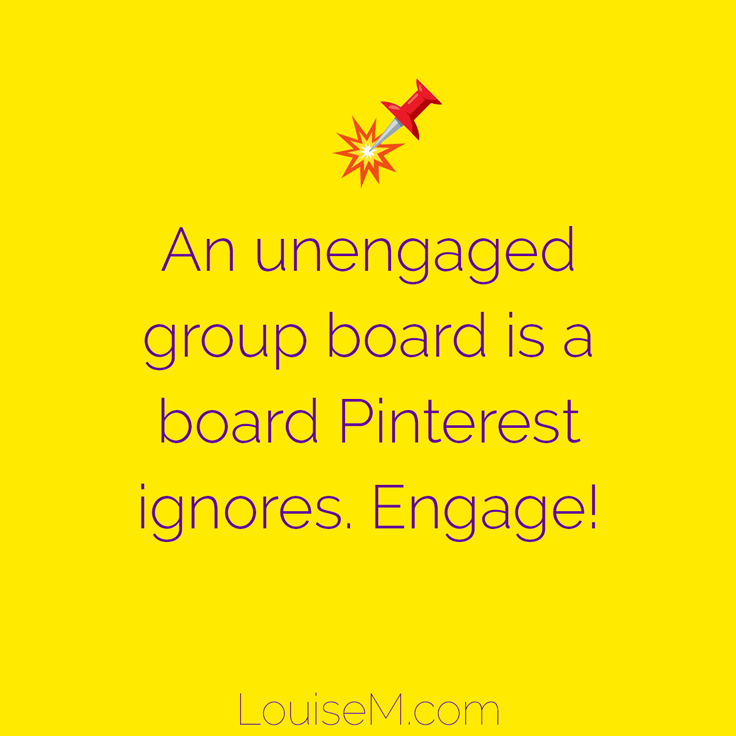 An unengaged board is a board Pinterest ignores. It gets repins: You can only find this info if you’re already a contributor. Check the board’s virality score, as well as the repins you’re getting on your own pins, in your Tailwind stats. Check “Boards with the most clicked Pins” in your Pinterest Analytics (not super helpful). Go in-depth: How to evaluate group boards. It has a decent number of followers: What this means to you may be different from me. If you have 20 followers, then a board with 100 is a score. In any event, I don’t think follower number is as critical as the other points. I’ve had my content go viral on a (non-group) board with 5 followers! Some combination of these factors is going to make for a great group board for you. I doubt you’ll get everything. I’m on some boards where the virality score isn’t great, but there are 10’s or 100’s of thousands of followers, so they still perform for me. It’s hard to leave a group board… how well I know. You feel special to be added. And now you’re going to up and leave? Well, don’t be too hasty. Have pins scheduled to the boards? Wait ’til they’re done. But stop scheduling new pins to poor performers now. If you’re certain you want to leave immediately, you can change the board the pin will post to. Otherwise, you’ll get the “Failed Pin” message if you’ve left the board. And, keep checking your stats to see the results of leaving these boards! 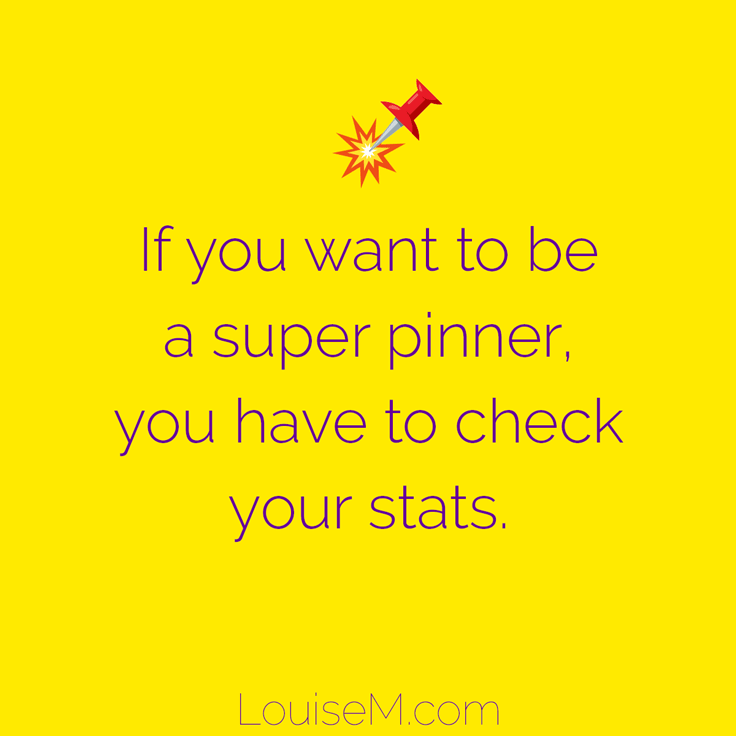 If you want to be a super pinner, you have to check your stats. Low performing boards bring down your average repin rate. Pinterest loves to share content that gets a lot of repins, from pinners who have a high repin rate. Weak group boards lower both of those averages. Well, maybe. But if the pins aren’t being shown to anyone (due to spam or low engagement on the board), this theory is busted. It’s giving you considerably less repins than your overall average. I’m not sure how to determine this if you don’t have Tailwind. And the point at which you decide this is up to you. My overall repin rate is 14.6, and I’m starting to just leave boards that are under a 1 (and sadly, that’s most of them). And by “leaving” I mean, I’ve stopped scheduling new pins. I’ll re-evaluate when all my pins scheduled to those boards have posted, and again a month later. Only then will I decide to remove myself from ever being able to pin there again. To go in-depth, read: How to evaluate group boards. You know all those blog posts saying how awesome group boards are? They’re probably offering a list of “open” group boards in exchange for your email address. Sorry, but all-topic, open boards are worthless. Is your email address? Visit pinner profiles in your niche and check out group boards they’re pinning to. Group boards are indicated by 3 faces in the circle, instead of 1. Network! Ask pinners in your niche, and blogging buddies. Facebook groups: Some are dedicated solely to Pinterest group boards! Here’s one. This list is gold! Top performing group boards by category on BoardBooster. All have a direct repin rate of 1 or better, and they’re ranked by repin rate. PinGroupie: Yay, this site is functioning again! Find it here. The group board description will (hopefully) tell you how to be added. Don’t feel rejected if you never hear back. This happens to everyone – me included! The response rate is probably less than 50% – even when they’ve left instructions! If there are no instructions, they may not be open to new contributors, but you can try the tricks below to join group boards. Note: the board owner is listed in the URL, and is the first picture shown. Connect with the group board owner on Facebook, especially if you can find him/her in a Facebook group for bloggers or small business owners. Look on the group board for a special “Add Me” pin, and add a comment asking for an invite. Comment on any pin that belongs to the group board owner and ask for an invite. Find the owner’s website URL on their Pinterest profile page, and use the contact form on their blog to connect. Scroll through the list of current board contributors. If you find someone you know, ask them to add you to the group board. Depending on the board settings, a contributor may be able to add other contributors. Or, they can tell you how to contact the owner. Related read: How To Join Pinterest Group Boards Deep dive! 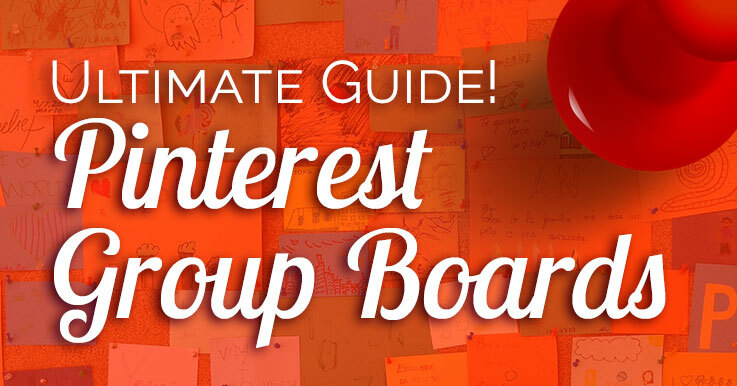 Should You Host Your Own Pinterest Group Board? Trust me – it’s a job to moderate a group board. You’ll want to think twice about this. If you have a handful of followers now, sure, adding 50-100 followers by hosting a group board sounds amazing! If you have some business buddies in your niche, by all means, creating a group board could be helpful to all of you. It probably has a much better chance of succeeding than a board of collaborators who don’t know each other, and have no interest in helping each other. Limit the topics to your business niche. Who needs new followers if they’re not interested in your niche? Limit the pinners (I suggest 50 or fewer). You don’t have to accept unknown pinners! You can create a board just for your peeps. Delete off-topic and spam pins. Want to grow your group? I recommend you check in with people who aren’t actively pinning and sharing. Weekly activity is best, however I set a minimum of once a month. Below that, I’d rather replace them with someone more interested in the board. I have a group board I created many years ago, for a blogging circle I was part of. For a few years after their initial interest, I was the only one pinning on it. It performed well. A couple years ago, I opened it to all bloggers, and its average repin rate started declining – until it finally dipped below 1 repin per pin. After much consideration, I decided to try to salvage the board by limiting the topics to only business-related. I eliminated the original pinners who hadn’t posted in years, then sent an individual message to each of the 30 or so remaining pinners (this took hours!). You don’t have to do this! You can just remove people if you want. But I thought it would be nice to give them a warning, and a grace period. My suspicion is that a board of unrelated pinners who have no accountability, or vested interest in repinning their board mates’ content, is doomed to fail. I couldn’t justify keeping this board open to collaborators. The repin rate was .64, which is less than 2 for every 3 Pins on the board. If I knew who was repinning, I might keep them, but Pinterest makes it impossible to know. I finally closed the group board in late March 2018. I let the last handful of Pinners know a week in advance in case they had any successful Pins they wanted to move to another board. Then I deleted them and all their content. My repin rate on the board instantly doubled. My virality and engagement scores hit a 30-day high. So what do I recommend for hosting your own group board? Open a group board only to people you know, who want to support each other’s success. FREE Pinterest group boards Cheat Sheet! 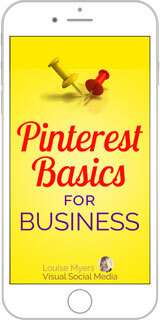 Download the cheat sheet in minutes, AND get the FREE Pinterest Basics e-course! Get the cheat sheet plus ONE Pinterest action step each day. Join now! 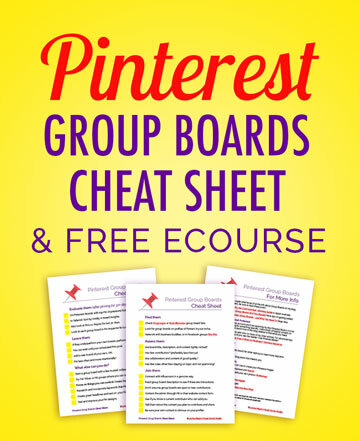 CLICK to get your FREE Pinterest Group Boards Cheat Sheet and free e-course! Should you join Pinterest Group Boards? How do you find them in the first place? And, my experience hosting a group board. This is all my opinion, based on my experience and stats. As I’ve noted, you may have different results. But I think this is a great place to start. For an in-depth look at boards you already contribute to, read: How to evaluate group boards. If you’ve joined or hosted Pinterest Group Boards, please share your advice or experience in a comment! These are some great points. I have noticed that about pin groupie too. It has very old information. Thanks for the tips and tricks. I need to clean up my group boards and reevaluate them. It’s a wise thing to do! Best of luck. I am not a blogger!! I don’t care how many of my pins are being repinned. I’m not pursuing a career as I already have two degrees. I come on here to view the wonderful pins posted by extremely talented people. I love the photos of people doing their version of a pin. That has happened to me and I was in awe of the creativity of these people. Everything else you said about boards and the traffic and the rest was just blah blah blah. I’m so disappointed that even this has become a competition instead of just sharing things people enjoy. No worries. 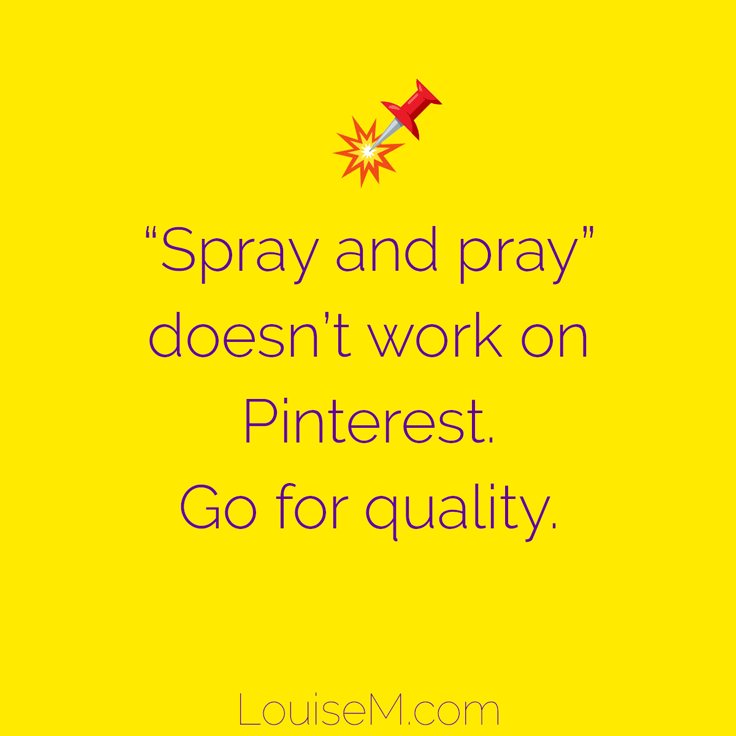 If you’re not on Pinterest for business, then you don’t need advice for business people. Thank you so much for this Amazing Guide & Tricks Plus Tricks. Actually I was doing a search in PinGroupie the other day and saw that some of the boards had been crawled just a month ago! So looks like they are (partially?) back in action. Hi Louise! It looks like some updates are happening now. Still seeing a lot that say 1 year ago though. How are you faring with group boards? Through this experiment, I’m finding I’ll probably leave 90% of them, and will most likely kick all contributors off mine too. It keeps getting worse despite my efforts. Tailwind Tribes seems to be the answer if you’re looking for repins. When you say that you have a average repin rate of 14, are we talking after a specific time period, like a day, a week or a month? This is an average of all my pins, and it updates daily. I think the only way to get this number is through Tailwind, under Profile Performance > Virality Score. I hope they work for you! For me, I don’t feel it’s worth the time to pursue them now. This is an awesome post! Thank you for the time and research that went into it! Interesting to hear that you think group boards aren’t worth the effort anymore. I wonder what you’d suggest for growing your pinterest following and pinterest referral traffic without them. Great question Kim! I’ve been joining more Tailwind Tribes. If you don’t use Tailwind, you can still use Tribes for free as it’s in Alpha testing right now. You can use Google to find some Tribes that fit your niche. While I’m leaving most of the group boards I’m on, I do have two or three that work well for me. It’s been a TON of effort to find them though. I think they can still be useful for pinners in the early stages of building an account. Once your own boards are performing 10x better, then they’re probably just hurting you. I am so excited to read this. My Pinterest page views have been tanking lately so I thought amping up my pinning was the answer but numbers just kept dropping. So I added more group boards (I have 85 right now!) and they still dropped. I Tailwind AND manually pin daily. The last several days have been busy so my pinning has not all gotten done. And my numbers are gone up. I am so excited to finally have a game plan to try that is new. Thanks! A couple of questions. In Tailwind I do know that repin numbers are ignored. So when I schedule MY pins to a group board in TW it is like a brand new pin. Do you think this affects anything on Pinterest? Don’t they show preference to pins with higher repin numbers? I do have quite a few boards that I know are awful. I will stop scheduling to them after this week. However, if I have them on my board but I do not pin will that matter to Pinterest? Do I need to leave them to get noticed by them? And when I do leave will Pinterest be affected as far as showing my pins in the smart feed? ALL repins in Pinterest are now brand new pins. They no longer carry the same URL as the original pin, or the engagement number. Kate Ahl’s company manages dozens of Pinterest accounts and they’ve done extensive testing in the past as well as last month. Absolutely NO difference between pinning manually or using Tailwind as far as engagement. Just WAY easier with Tailwind! Changes in your Pinterest stats can reflect things you’ve done weeks or months ago. So you shouldn’t get too upset when you see fluctuations. The end of ONE pin’s viral run, or the season, can hugely affect your stats. No one can tell you one specific thing will affect your stats in an exact way. Too many variables. I can’t tell you whether or not you should leave bad boards, just that I would. I never even finished publishing scheduled pins to my worst boards. I dumped them a couple weeks after writing this. Very very interesting. I am pretty new to using Pinterest for traffic – like stumbling around in June, now have Tailwind going just the last week or so. I’m currently in a Christmas niche – wondering if the group board thing will help now? Hurt? I have 21 followers, so looking for anything. Only a couple of tribes even related to decor, going to try that later. Any thoughts on someone starting brand new? Thanks! Group boards and tribes should help newbies more than they help established accounts – the trick will be getting accepted into some good ones. If you blog, look for the Striving Bloggers tribe. It accepts all niches. Not as good as a niche tribe, but better than nothing. New accounts need to pin a higher % of others’ content. Just make sure it’s top quality and on-niche. When you are looking at your Tailwind statistics, it’s it mainly your Virality score that you’re looking at? I’m on way too many group boards, many that I know are underperforming, but strangely, I get much different results when I look at Engagement Score, Virality Score and even Repins. I wasn’t sure which I should be focusing on when trying to find the poorly performing boards. The virality score is the fastest way to judge a board’s overall performance, however to determine exactly how YOUR pins are performing on a specific board, go to Optimize Content > Pin Inspector > By Board, and choose each group board one by one. You can see the total pins you added to the board in that time period, and add up the number of repins if you want. Or, if you’re just seeing a lot of 1s and 0s, make a judgment call! As time permits I’ll add this to the blog post with an image. BTW, engagement score isn’t important to me. I’m on a group board with .01 engagement score, but it’s my second best group board, because it has almost a million followers. So even a .01 rate is sill a lot of engagement! And the repins number will vary by the number of pins on the board. So on the board insights page, the only number that helps is virality, because it shows repins PER PIN. Thank you! I was going to ask the same thing. I wasn’t sure whether to use the Virility score or the Engagement score when looking at my group board stats. I wonder if I should seriously limit the group boards as some of my personal boards are doing much better, and then rely on Tailwind and Facebook repinning groups to spread my pins around. It’s hard to say, as there are so many factors involved. I’d say it mostly depends on your account and how strong it seems to Pinterest – as well as the accounts of owners and members of group boards, or sharing groups you use. All can be helpful to less established accounts. Thanks, I have been looking for exactly this feedback. None of my group boards are working for me at all, this is the validation I needed. I have a pretty decent start to Pinterest followers at just over 1300, but I’ve been stuck there for a while. I have been trying everything, including Tribes, but not gaining much traction. Guess I need more research in more tribes. My niche seems to be hard to find. My analytics look like a see-saw. I’m dumping nearly all my group boards, we’ll see happens. Some of my own boards don’t have a lot of repins, especially since they aren’t all niche specific (tween/teen mom blogger with many boards that are home related) but I found when I made the “extras” secret I tanked my account. Home decor is high in my demographics interests so it all stays. With over 16000 pins, guess I’m just a pinterest horder, lol. Do you delete under performing pins too? My first caution to you would be that it sounds like you may be overreacting at times. 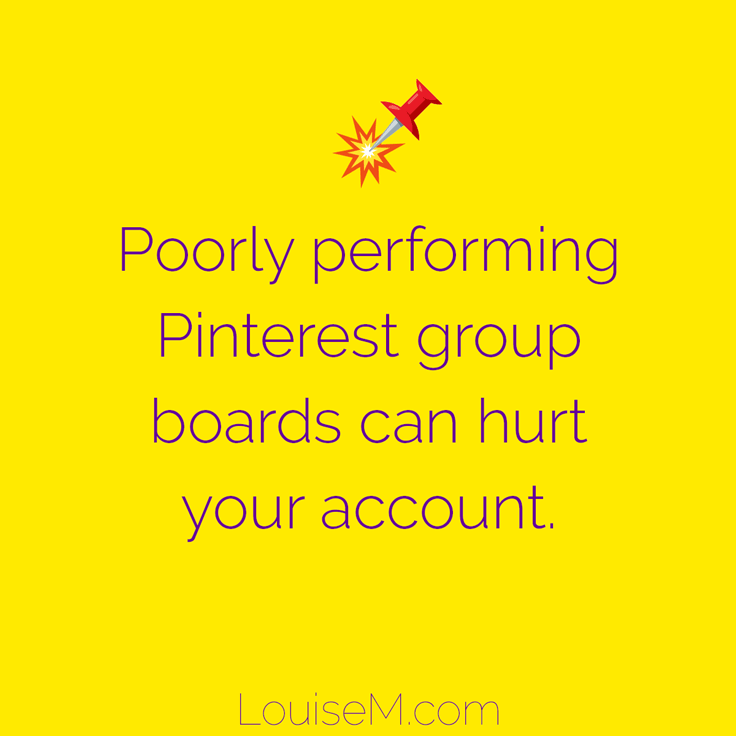 If you suddenly make 10 boards secret or dump 10 group boards (or add 10, or pin a lot more or a lot less) this may cause a throttling of your account until Pinterest figures out what you’re up to. Also be aware that your stats this month can reflect stuff you pinned and things you did months ago. Pinterest is a long game, and you need to take things slow. I do delete pins, but not ones that point to my own site – plus I am extremely judicious about what I will pin. I also pin VERY little of others’ content any more, so I don’t delete much. Here’s what I wrote about deleting pins. Thanks for this article – so helpful! What’s the best way to find out which group boards provide the most clicks back to your website? I know how to look for # of repins by board in Tailwind – but don’t see anything for website hits. Pinterest stats has a report with boards with the most clicked pins in the past 30 days but it is limited to the top 20 boards – plus it covers all boards and not just group boards. Does what I’m looking for even exist? Yes! It’s pretty hard to dig out though. I’m actually working on a blog post about this. Since I have a lot of content stacked up – it may be 2-3 weeks. This article is just what I needed. I was searching for a way to reduce the amount of time and effort I put into pinning. but wasn’t sure if I was to accomplish that by reducing pinning, stopping manually pinning to group boards or how to evaluate which group boards weren’t preforming well for me. Through reading this and reading through the comments, I see that I can reduce my daily scheduled pins down by 20, and can return to scheduling group board pins with Tailwind. I was also very surprised at how little repins I was getting from all the group boards I was a part of, I left all of them except three – and I was in around 20. I think I should only stick with one of the three that are left, but I will look at repin stats again in a few weeks to decide. It just goes to show how much time I was wasting for so long with all of those others. What is your opinion of looping pins with Board Booster? I am considering getting rid of this, as I am not sure how useful it really is. I don’t use BoardBooster, but I know some people love it. However, it’s not an approved Pinterest partner, and because you share your login info with them, it does break Pinterest’s ToS. Hi! Thanks for the great article! I have a question regarding group boards – if I unfollow a group board leader that has invited me, will I automatically be out of the board? Pretty sure you can’t post to a board you don’t follow. But if you don’t even want to follow the leader’s boards, you shouldn’t be on their board anyway. 🙂 it was by accident! Thanks for the answer! I am trying to up my Pinterest skills and have been looking at tw and board booster – thank you for the warning abt bb. I use meetedgar for facebook – do u k ow it tailwind is similar? Guess I will need to work thru some of their training . Thanks for the help! I don’t use MeetEdgar so I can’t say. Tailwind is fairly unique, in my experience. The awesome features are board lists and interval scheduling. Learn more about using Tailwind here. Thanks for this great piece, I am looking forward to cleaning out my pinterest paths. The info you have given us here will be a great start for pinterest dummies such as myself! I rarely ever comment on blogs, but I’d just like to point out that PinGroupie did shut down for a while but are now back online. It’s not a foolproof tool, but it does help you get started, so I thought you might want to update that part of your article. That said, this post is very helpful and thanks for putting it out there. Thanks for this post! When you leave group boards, do you delete your pins before you leave? I’ve heard someone say they do this, but I don’t know why this would be beneficial. I only pin my own content to group boards, and I never delete my own content. That’s my philosophy! 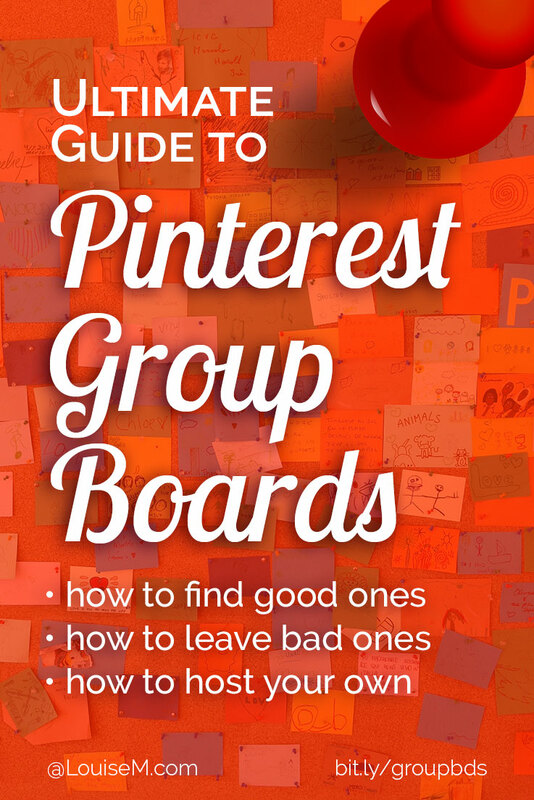 That’s an amazing guide to Pinterest Group Boards. You’ve covered almost every part and I learned a lot about Pinterest and how to grow on Pinterest from your article. Hi! One of the ways you said we were able to join a group board was commenting, but my business account isn’t able to comment. Is this normal? I only just started using the account, but I’ve had it open for about a year. Nope, not normal. Unless they’re testing removing the ability to comment. They seem to be testing a lot of things right now! Hi Louise my name is Carolyn Garcia Could you please give me any insight to blogging I just got my name and boards up but I haven’t started, like finding a niche, trying to find the directions of how to get your board set up,who to pick etc. I have alot of boards but mostly about food and especially baking. I’m on a low budget yea I cant afford alot when signing up or to get my board active. Any insight would help me. I understand your a very busy lady and thats ok if you are to busy I understand completely. I’m going to follow your board and subscribe to it if ok with you. Thanks for listening. Sincerely a newbee Carolyn Garcia. I think you’ll get a great start for absolutely free by signing up for my e-course. If you haven’t yet, look in the upper right corner of this page. I think I’ve covered all your basics. And don’t worry about group boards yet, just set your foundations as outlined in the course. 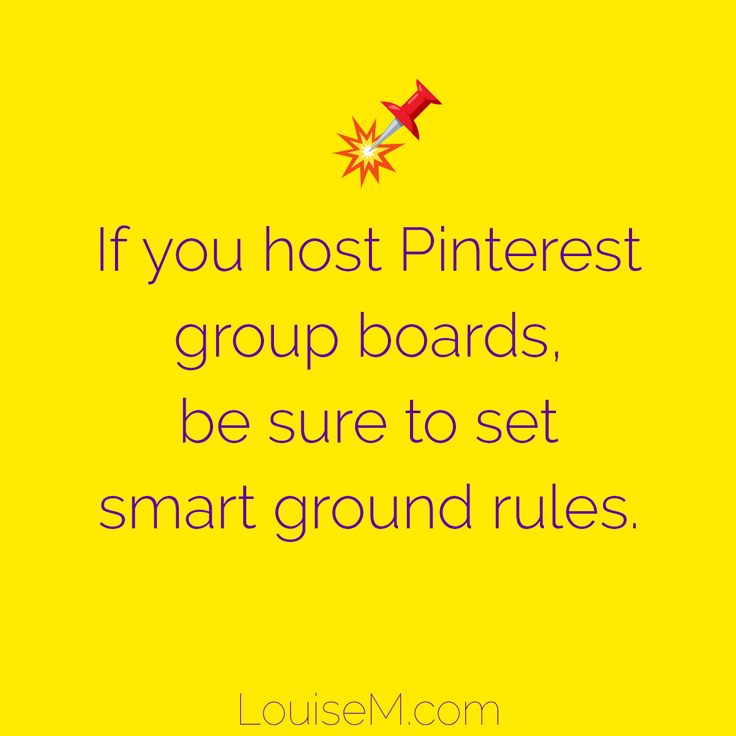 Found this post through Pinterest 🙂 As a new member, I greatly appreciate your honesty with this post as I’d been wondering about group boards! Thank You! Just found this post on Pinterest! Great information here. Repinned and using a lot of your tips and advice. Thanks so much! Yay, Pinterest works! 🙂 Thanks Kelly. This is honestly by far the best article i’ve read with pinterest tips. I’ve been on pinterest for roughly 4 months now and i was wondering why it was so hard to get followers and repin s considering i had joined over 50 group boards. All the articles i read on pinterest tell me to join as many as possible and to repin as much as possible. Nowhere has it been mentioned that there was a pin limit so thank you for this tip! I went on tailwind as you said and i see why i wasn’t getting any repin. Practically all the boards i’m a part of have less than 1 repin rate and these are boards with over 1k contributors. I will take your advice since clearly these boards are not working for me and see how it goes from here. That might have worked 2 years ago, but it hasn’t worked for quite some time. Best of luck! Just found this post on facebook. Thanks for the tips. Currently, I only have 10 or so website post pins, how many should I have in my arsenal before I get tailwind? You can make use of Tailwind at any time that you’re serious about Pinterest. Perhaps I’ll explain further in a blog post at some time. Thanks for this article. I love how honest and different you are. You’ve taken a different approach to the same old same old advice I get on group boards on Pinterest. And yes, it’s difficult getting into one. So far, I’ve only managed to be accepted into three! I wouldn’t worry too much about them, Sheeroh. They’re not all they’re cracked up to be. Thank you for putting all of this helpful information together in one place! I feel like I have been spinning my wheels trying to get anywhere with Pinterest. There is so much conflicting information. I think from what you’ve written I am on the right path, but I know it will take time to build any kind of following. I have an article coming up about optimizing for search on Pinterest. It’s really not dependent on followers. Can you please guide me how can I be contributor to the Guest Board in details Please it will be very helpful for me for my business. A post all about joining group boards is coming in a couple weeks. Great article with so much experience and hard-earned, “in the trenches” wisdom. I thank you for sharing! First of all I have to say it’s nice to see someone who has actually replied to every comment made. I know it takes time to do so, but I think it’s important for bloggers to do. I’m looking forward to reading more of your posts and going through the free course I signed up for. I’ve been using BoardBooster, but it sounds like there are several reasons why Tailwind is better. I went through and evaluated my group boards a few weeks ago just thinking that I probably belonged to too many. I only used Pinterest analytics to help me decide what to leave. I started my own group board a few weeks ago, also. I believe it’s good for my niche, but now I realize I will have to be diligent in monitoring it. BoardBooster has a monitoring tool. Does Tailwind as well? I’ll read your post about how to use Tailwind to see if you talk about it there. Thanks! If you’re talking about monitoring who pins to or shares from your board, no. BB isn’t a Pinterest partner so they do things that Pinterest doesn’t approve of. It’s me again. ☺ I just thought of another question. I’m part of a fairly active group board as far as number of pins. Repinning is required, which I do. I’ve noticed that only the hostess has been repinning mine, but she repins back to that group board. Does that do anything for my pins? Would it be better to have them repinned to individual boards? Thanks! Individual boards almost certainly would outperform a group board. And repinning the same content on the same board in short order could get the board seen as spammy by Pinterest. It’s very difficult to find Group boards on Pinterest. Any suggestions? And I agree with you group boards seems losing the point. I converted my private account to business and just made my personal boards private. Does having private boards penalize me on Pinterest due to the lack of engagement on those boards? They’ve never said, but it seems highly unlikely. I haven’t tried this yet but is it possible to leave a group if it is performing poorly, or do I have to ask the board owner to remove me? Just click on the edit pencil and choose Leave. I never even heard of most of the things you’ve shared in this article. The only strategy I have heard of, and have been using till now, is ‘More group boards, more pins, more results’. Even though my Pinterest views increased ten folds, I didn’t find any considerable increase in my blog traffic. I now have a pinning strategy, and my blog traffic went from 1-5 visitors/day to 10-15 visitors/day, not an appreciable increase for the amount of time, work and money I put in. After reading your blog post, there are some questions that have popped up in my mind. 1) How do I check the repin rate of a group board? 2) Should I give up on Pinterest group boards and go for a Tailwind tribes power-up instead? Read how to evaluate group boards. Keep the group boards that are working for you. Usually these are very niched and have less than 10 contributors. If you have Tailwind and are using tribes successfully, it’s up to you whether to power up. Jen, mentioned in this article about tribes, found it invaluable for getting her blog traffic jump started. Now she’s going to scale back. Just be aware, tribes also take time to curate good content. If you’re just starting, don’t power up til you’re using them effectively. Here’s another post that has 7 Tailwind tribes mistakes. 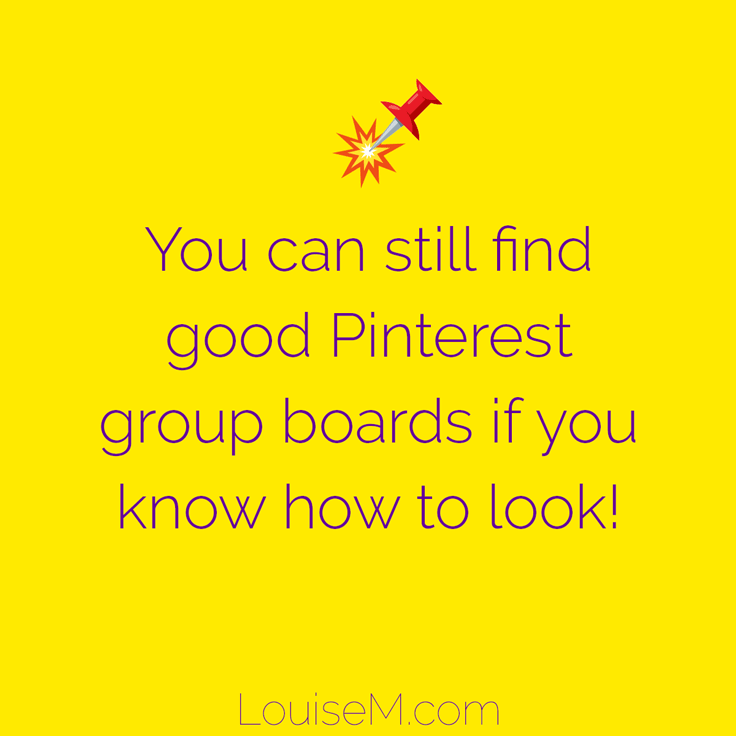 After reading your blog post yesterday, I evaluated all the group boards to which I have posted, based on the number of pins I have posted and the number of repins I have got on them, and most of them have a repin rate of less than 1.0 . A handful of them had 0.00 . It is absolutely ridiculous, to think that I have been wasting my time, energy and my scheduling queue for these group boards. Those are incredible numbers of followers and clich-throughs. You are clearly very succesful in what you do. I was very interested in what you had to say about Pinterest Smart Feed. Nice tips! I didn’t know that the Pinterest algorithm relied on engagement for pins to show in the feed, but that makes sense given how various other social media platforms operate. Definitely time to start joining some Pinterest boards and get to pinning! It’s really hard to get on good group boards. And now Pinterest says they’ll show Pins from group boards even less often. Best to create an assortment of boards on your own account that are tightly niched, and you have control over. Sorry, I don’t know a way to easily find it. It’s getting tougher to get added to group boards these days so don’t put too much effort into it. 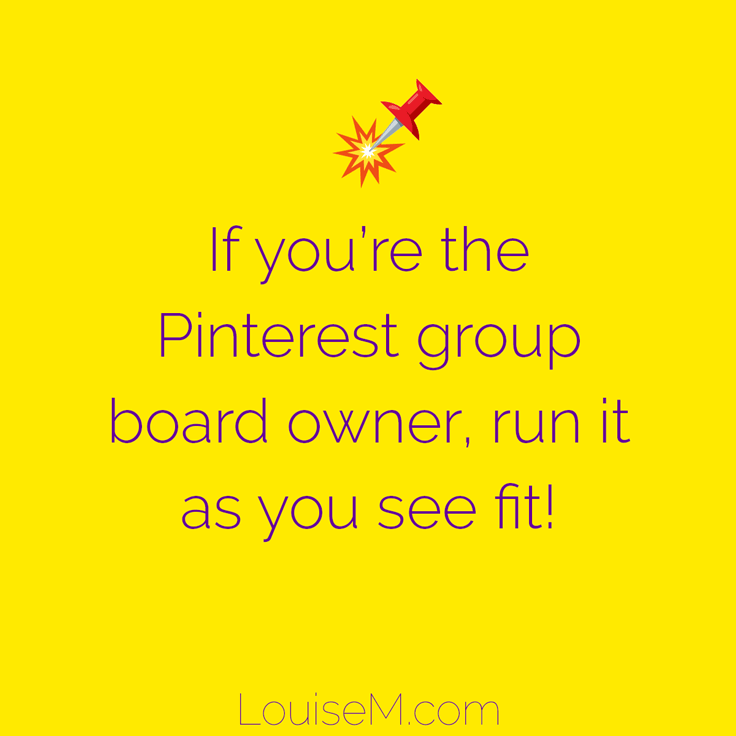 As a newbie I have read lots of articles saying how important it is to join group boards on Pinterest to turbo boost your traffic in the early stages of your blog but I note you are saying it us getting harder to join group boards and you advise not to put too much effort into it. Would you not mind elaborating on this for me as I though being part of several group boards was going tohave to be fundamental to my traffic in the early days ? 2,368 words isn’t elaboration enough? Advice to join group boards is about 2 years old. “Then I deleted them and all their content. Wouldn’t Archiving your low performing Boards have done the same thing without the hassle of having to delete things?…Thanks! Not at all. I didn’t archive (and thus lose) the board. I turned an established board into a viral board in about 10 minutes of “work.” You can delete collaborators and their content in 2 clicks. Hello, I have have a question about using the categories in the group board. I have started a group board and some of my pinners don’t use the categories. Does this matter do i need them or should i just let them pin their content without putting the pin in a category? does it make any difference on the performance? is there a way of messaging these people all at once as a group? Pinners using Tailwind can’t pin to sections. Sections are pretty useless so I wouldn’t worry about them. No, there isn’t a group messaging feature. I’m so glad I happened upon this post. I wondered why some of my boards (just me) preform better than many of the group boards I collaborate on (of course nothing close to your engagement and virality). ALL other articles I’ve read sing their praises. I now understand group boards can be positive, but not always. I’m so glad I did not spend more time trying to join any and all group boards. I’ll be checking out more of your articles! Glad to hear it, Rachelle! Best of luck. What an awesome post, so many ads but I understand!! so the tips here have been the best seen so far in text and would you know if there is a set limit of boards we can join or see, I have 72 and joined another 25 but I cant see them so I’m guessing I will view the low performing after 3-5 days and just find groups with higher pins or people and monitor, storing the ones I left in an excel file. Groups/Boards to stay away from hehe. Please write post on Sections and value of using them. Im trying to work out why my own group board have a higher Virality Score than a board running much longer with more people is less. What could I be doing right that I should replicate? Using TW also and Pinpinterest, are there any others you suggest? now seeking a section on ads and testing what works for my niche. Number of group boards: I don’t know about a limit but you’re on a crazy amount. Group boards with a huge number of contributors almost NEVER perform. Perhaps you might re-read all my posts about group boards. Pinpinterest: Only use this if you want your account disabled. Pinterest mentions the pin and group board limits for a personal account, but i don’t see anything about the limits for a business account. Is there a difference? Yes, I’ve heard they lifted the pin limits for business accounts. Don’t know about board numbers, but 500 should be more than enough, and more than mot businesses could keep active. Thanks Louise for a no-nonsense guide to group board. But I have a question regarding the small vertical image that is Pinterest optimized at the beginning of this post. Did you add that image using an app, or manually? If you used an app, may you share what app is t? No app needed, but you do need a bit of HTML. Here’s how to embed Pinterest Pins. to invite and only want to attract those who are truly as passionate and mindful about pinning as I am, so I haven’t invited anyone at all. What’s the best way to find an organic audience to join my boards? My niche is DIY projects and home decor. I’ve found many groups will post they’re boards are open, but when you follow their instructions you never hear back…so this is why I decided to start a few of my own group boards. There’s a FB group for this purpose. The problem is, few people are interested in group boards any more. If they are, they’ll join ones with a lot of followers. So it’s a catch-22. It’s not something I would spend much time on. Thanks for all the useful info Louise! If I own several poorly performing Group Boards is it better to delete them or to archive them? Also, is it possible to change my Group Boards back to being a regular board? I chose to delete others’ content and tightly niche the board to work for me. This has been very effective. You could also just leave the other content, it will eventually pass into obscurity. and engagement (.24) according to Tailwind and I don’t want want it to bring down my other boards….it also has 59k Followers. Delete it or archive it. Opinion?